There are a million different things you can do with all of the LED light strips out there these days, but most of them are a bit silly. LED lighting is so cheap that it’s popping up everywhere, but the trend will undoubtedly pass soon enough. When used properly and tastefully, however, LED lighting can be pretty awesome. A perfect example is the Vansky Motion Activated Bed Light. This smart device has been one of the most popular items we’ve covered in recent months. 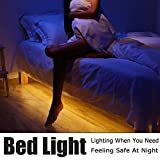 It illuminates automatically when you step out of bed at night, casting a warm glow on the floor that lets you see without disturbing your partner. Seriously, you’ve got to check it out. Motion Activated — Built-in human body passive infrared (PIR) motion sensor light with automatic shut-off timer. Automatic Turn on and Shut off by human induction in the dark environment. Inductive range: 3.6m (11.8feet), 100°.